The infield played a little slower than normal. Then again, that is how dirt usually tends to play after nearly ten inches of rain soak the ground over the course of a week. It was on that slow infield and rain-soaked ground that three people cashed in on a truly unique accomplishment. Charlene Dunne traveled to Austin, Texas to compete in the NAGAAA 40th Annual Gay Softball World Series in August of 2016, just like thousands of others. Thousands of players and coaches made the trek to Texas to try and realize their dream of a championship. Daniel & Sammy Byrom also made the trip from the Kansas City area down to Austin for the tournament. 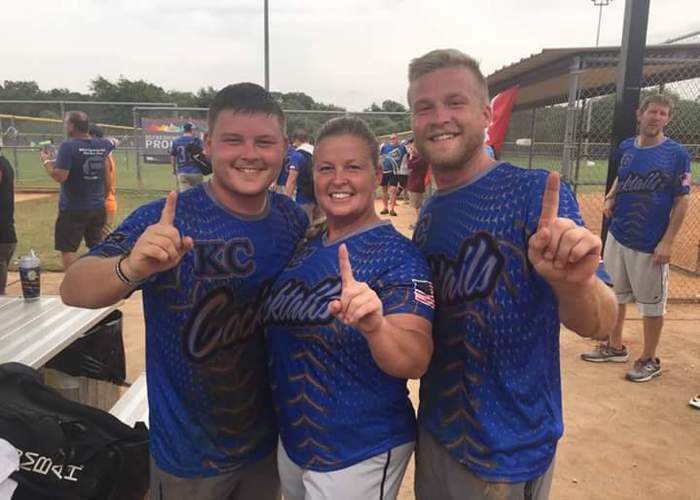 Their team, the Kansas City Cocktails had just wrapped up the Heart of America Softball League’s C Division regular season title and after several strong tournament showings, they were ready to go for a World Series title. It’s not unusual for teams to get close once they’ve been around each other for a while. The word “family” is used a lot by NAGAAA teams to describe the bond they feel with one another. In the LGBTQ community, family is often chosen outside of blood relation by necessity or choice due to the many unsupportive parents too often jaded by ignorance, stubbornness or religious ideologies. Young men and women are thrown out of the house or ostracized by their blood relatives because of who they are and who they love. Friends and teammates are family in gay softball! It might have seemed strange to see someone like Charlene, a straight female from a conservative area of the country playing ball with a predominantly gay team at the Gay Softball World Series. However, she had built up a bond with this group of men – a bond that went beyond a softball team. She was not just a teammate, especially not to Daniel and Sammy. She was their mother and the three of them embarked on their tournament journey as a family and as a team. “Their team needed a pitcher,” said Dunne. 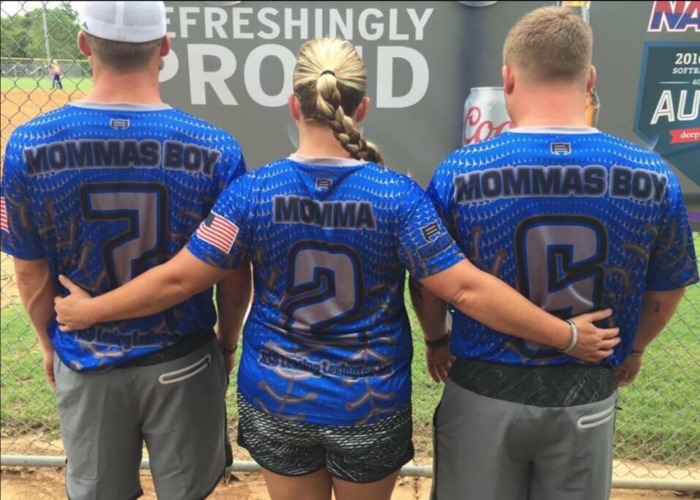 “I thought that it would be amazing to play ball with my sons,” she added. Charlene came through for her boys, just like she always has. Softball was old hat for Charlene. She grew up one of seven children, but her mother always made sure that the kids could play sports. Softball runs in the family, which made it even more special that they got to share this experience together. “We have such a strong bond,” Daniel said. Daniel and Sammy naturally gravitated towards sports from an early age with support from their mother. “She never pressured us. She just wanted us to be who we are,” added Daniel. Once she answered her sons’ call to play, the team knew they had an experienced and accurate pitcher to go along with Daniel’s all-around ability and Sammy’s speed. Mix those ingredients with a group of talented players and they had the makings of a championship team. The tournament was grueling as the rain wrecked the pool play schedule and drastically changed the playing format. Time limits were slashed to get more games in between rain events. Some games were even played by one pitch rules where a batter only got one pitch to get a hit or take a walk. If the pitch was a strike it became a strikeout. Through it all, the Cocktails stuck together and so did a mother and her sons. The team got by some tough opponents in the early part of the double elimination tournament before finding themselves in the C Division championship game on Saturday afternoon at the end of a long week of games. With no losses in tournament play they came up against the hometown Austin Outlaws for the title. The pressure of a title hanging in the balance didn’t slow the Cocktails down one bit as they won the championship game by run rule. One could imagine the pride felt by Charlene after working with her sons to win the tournament. But if you bring up her boys in conversation you can tell that she’s proud of them every day. “My sons are very gifted and I will be right beside them every step of the way. I’m the proudest mom ever,” said Charlene. It was an emotional event for everyone involved as they stood together on the field and had their pictures taken as the champions. The celebration moved to the trophy tent as hundreds gathered inside to witness the championship trophy ceremony. As the trophy was hoisted, there were more than a few tears shed by this family. “I cried knowing how special the moment was. Not many people can say they won a World Series with their Mother,” explained Sammy. It was clear on the field and in their lives that these young men had unwavering support from their mother. That support allowed them to reach their potential, both athletically and as human beings. The role that strong family support can play in the lives of young people is immeasurable. For Daniel and Sammy, it helped shape them into the people they are today. “I think our story sends a message to people around the country to get involved with your parents and let them be a part of what you do, because you never know what good can come of it,” said Sammy. NAGAAA softball players are each other’s family, but the Kansas City Cocktails took the meaning of family to whole different level in winning the 2016 Gay Softball World Series championship. NAGAAA is a family affair and you must experience it to feel it.